Have you ever danced on the back of a giant giraffe? That may sound a bit far-fetched unless you've stepped onto the fantastic floor of the new Hawaiian Tropic Zone. The stained floor accents the hip and sleek interior design, and meets the owners' requirements for high performance and low maintenance. The stained floor graphic provides a dramatic jungle-modern theme. 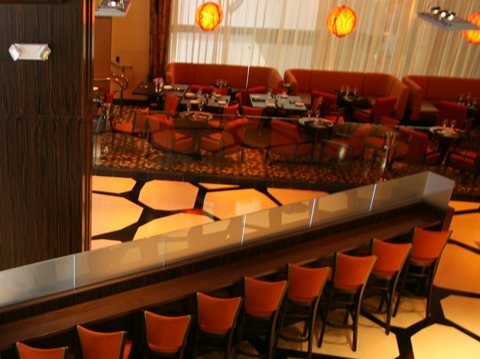 Architectural Stains, Inc.
Modern décor and decorative stains create an exciting attraction. Architectural Stains Inc.
Stained overlay provides durability for high traffic that requires easy maintenanceand clean-up. The Hawaiian Tropic Zone offers a visual feast and fine food. 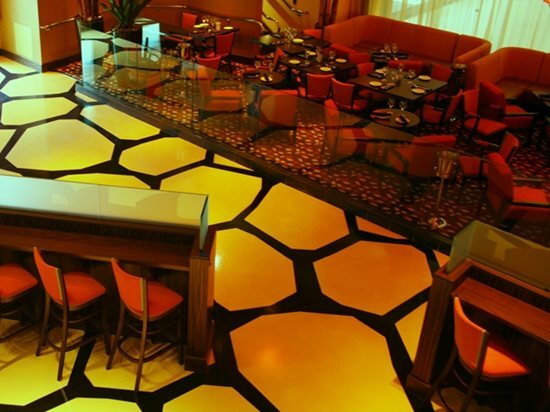 The huge graphic pattern on the floor, which looks like a giraffe hide, was produced by applying black acid-stain on a colored micro-topping. Architectural Concrete Systems (ASI) installed approximately 4000 sq. ft. of an integrally colored self-leveling topping to provide the peach-colored smooth background for the floor. Then, following a sketch, the pattern of randomly shaped blocks was engraved into the topping. The large scale blocks range in size from four feet to six feet in diameter. Acid-stain was applied to produce the contrasting black bands that create the appearance of a giant giraffe hide. ASI also applied a protective sealer. Situated in Las Vegas at the Planet Hollywood Resort Hotel and the Miracle Mile Shops, Hawaiian Tropic Zone is themed with a stylized jungle-modern motif complementing the ultra-modern furnishings. No hint of a genteel colonial plantation detracts from the integrity of the style. Hawaiian Tropic Zone was the brain-child of co-owners Dennis Riese and Adam Hock who set out to "revolutionize" dining by combining nightly floor shows with excellent cuisine from celebrity chefs. The duo licensed use of the name from Hawaiian Tropic, a popular sun tan lotion brand, founded in 1969 – also associated with a beauty pageant. In keeping with brand origins, the pared down yet grand décor serves as a back drop for a bevy of bikini-clad beauties who are the center of attraction during floor shows. Mikhail Zambon and her partner, Mike Anderson of ASI are veterans of the demanding hospitality industry where deadlines must be calculated down to the minute. They refer to it as a "no excuses" way of working. They often install very large scale floor projects that have to withstand high traffic uses. Deadlines and clients with high and very specific expectations are the main challenges they address every day while creating floor art "that has to be as durable as it is beautiful". "The floor appears seamless," said Mikhal. " To get this look with such large blocks of pattern, it would have been almost impossible for any other method to be used aesthetically that could stand up to high traffic. The angular and random shapes would not have been successful using tile or carpeting, and the durability of the topping is superior. 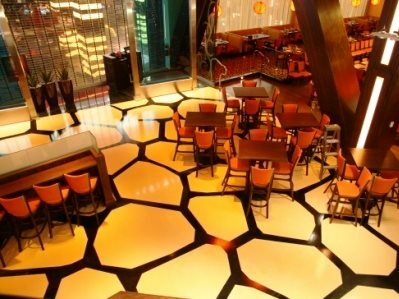 Carpet just doesn't work for the traffic in Vegas hotels, restaurants and retail locations." Floor contractor and stain artisan, Mikhal Zambon, started out as an architecture student, and also studied graphic design, textile design and fine art before finding decorative concrete. Even before decorative concrete reached its current popularity, Mikhal was drawn to working with stains and concrete because she could use the materials to produce anything she could draw. On large commercial jobs the task requires precision and attention to detail in fitting the graphic into the floor plan, but may not afford much artistic license. However, as she says, "I have also been lucky to be able to bring my own creative ideas to some projects." She is also a master in the art of creating graphic tapestries and logos on concrete and toppings using stains and dyes. In any project, ASI produces volumes of samples to make sure their clients' expectations are met. From the decorative concrete floor to the giant multi-media screen, all aspects of the new restaurant and entertainment destination make a glamorous and sophisticated style statement. 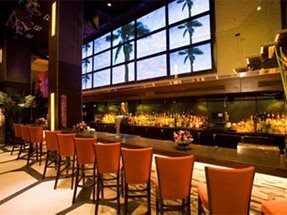 "Debuting our second Hawaiian Tropic Zone in the high visibility, international hotspot of Las Vegas is a natural," remarked Riese who predicted the huge media-genic appeal of the new restaurant and its location. Just hiring the world-renowned architect and interior design firm of Jeffrey Beers International was a decision calculated to make news. Since its opening in January of 2008, the Hawaiian Tropic Zone in Las Vegas has become a popular destination for celebrities, paparazzi and those who enjoy a visual feast along with fine food.